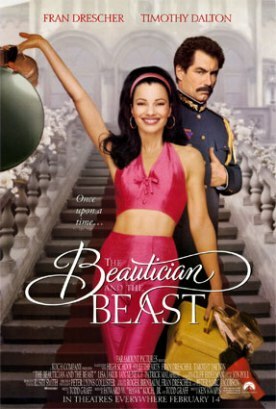 The Beautician and the Beast, written by Todd Graff and directed by Ken Kwapis, is built entirely on the comedic talents of Fran Drescher, “The Nanny” in a moderately popular TV series of that name. Unfortunately, those foundations are not quite firm enough to support the house. Or castle, as it happens, since the “high concept” of this film is to take a Brooklyn hairdresser and beautician with an annoying nasal laugh and a bad case of New York attitude and transplant her to a (sort of) fairy-tale setting in Eastern Europe. Part of the problem with the film is that the fairy tale setting, a mythical principality called Slovetzia, can’t quite make up its mind whether it is just emerging from a backwards communist dictatorship or a backwards monarchical despotism, and its attempt to combine the two by making Boris Pochenko (Timothy Dalton) both a hereditary monarch and a Tito-like dictator introduce a fundamental confusion which is only too typical of Hollywood movies into which politics intrude, however obliquely. So too the movie takes gratuitous swipes at Newt Gingrich and Jesse Helms who, Miss Drescher’s character asserts in a throwaway bit (which begins with tributes to Thurgood Marshall and Mother Theresa), must be homosexual partners. Just imagine what would happen to any movie which suggested such a thing about Bill Clinton and Al Gore! Would it not be considered grossly homophobic? Why, then, is it in this context just a jolly jape? Because, progressive partisanship, which nowadays means the politics of anti-anti-Clintonism (the progressives in America have never been too sure what they’re for; but they make up for it by being 110 per cent sure about what they’re against) trumps every other form of political correctness—even (as we see in the Paula Jones case) feminism. And of course Hollywood politics are invariably progressive. And in Hollywood, “progressive” is practically synonymous with sentimental. Of course the supposed dictator and tyrant Pochenko, known around the world as “Stalin—without the charm,” turns out to be an old softie who falls in love with Miss Drescher’s character, Joy Miller, and, under her influence, liberates the country himself. His kids (he is a widower), whom she has been employed to teach, are of course exactly like American kids ground down by subjection to their tyrannical father and enlightened by the ways of the West brought to them by their new teacher. There is also a wicked prime minister, Kleist (Patrick Malahide), who is trying to keep the old ways—and the old repressions—going and an 18 year-old dissident leader who also happens to be the boyfriend of the dictator’s oldest daughter. When he reneges on his promise to release this lad to his daughter’s arms and the revolutionary leadership from the castle dungeon, Joy returns to Brooklyn in castle dudgeon. But you know you don’t have to worry, right? You know how astronomically on the odds are that Boris will turn up on her doorstep in Brooklyn, impress her friends and parents and do one of those cute, New York verbal riffs in order to ask her to marry him? But then fairy tales are supposed to be predictable. That is why we like them. It is a different kind of predictability which is off-putting here, namely that which arises from the fact that, wherever it goes in the world, Hollywood never seems to be able to find anything that it has not brought there itself.